After Odeon's 1907 Mikado failed to sell well, the record companies evidently decided to stop making complete sets for a while. Compounding the problem was D'Oyly Carte's extended absence from central London, which presumably dampened the interest among those most likely to be buying records. However, in March, 1917, HMV renewed its interest and secured the artistic guidance of Rupert D'Oyly Carte's musical director and stage manager. This was enough for the phrase "recorded under the direction of Mr. Rupert D'Oyly Carte" to appear on records for the first time. Under the covers, however, the recording had hardly anything to do with D'Oyly Carte. As had been customary from the earliest days of the gramophone, the opera was recorded by stock recording artists whose voices were known to record well. There was little consistency in casting, and indeed it would appear that roles were assigned based only on who showed up on a particular day; surely, one cannot imagine that such a patchwork quilt of singing assignments would have been planned. This was the first complete set to include George Baker. (He had already recorded at least one G&S single—see Gilbert and Sullivan: The Early Records). Baker never appeared with D'Oyly Carte, but he had an excellent intuitive feel for the Savoy Operas. Even after HMV started casting authentic artists in most of the roles, a place was found for Baker on nearly every 78rpm set made. In the late 1950s, twenty-five years after his last G&S recordings with D'Oyly Carte, Sir Malcolm Sargent brought Baker out of retirement and cast him as the comic lead in several of the "Glyndebourne" recordings. Even in his late-seventies he gave credible performances, but certainly not as good as his 78's, which were made in his prime. 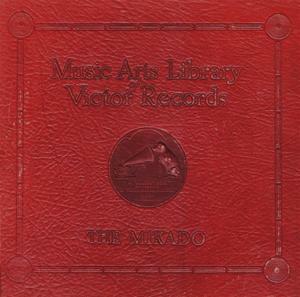 Victor used this album design when it issued this set in March, 1925. Victor later used the same album design for its issue of the 1926 recording, before replacing the design in 1931. 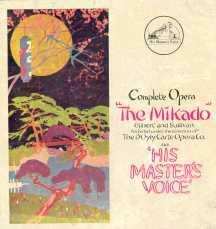 Baker sings "Our great Mikado" and "So please you sir"; Pike sings "I am so proud"; Radford sings "Brightly dawns." Oppenshaw sings "Three little maids"; Jones sings "So please you sir." Wood conducts "As someday it may happen"; Byng conducts the rest. 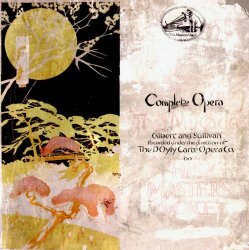 Compared with the 1907 Odeon recording (which has the benefit of Walter Passmore's Ko-Ko) and the 1927 recording (which has D'Oyly Carte singers in nearly all the roles) this recording may seem comparatively unimportant, although George Baker's Ko-Ko has been highly praised. You can listen for yourself, if you buy the CD re-issue on Chris Webster's Sounds on CD label. 1999 Opera Classics CD-ROM AE205 CD-ROM titled "From Which We Came," including numerous early recordings of opera. 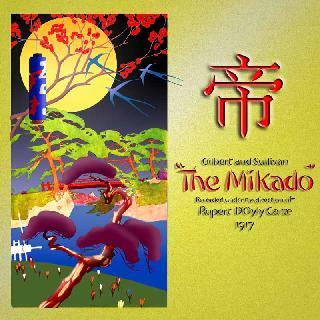 The G&S content (which is only a fraction of what's on the disc) includes the HMV acoustical recordings of The Mikado, H.M.S Pinafore, Princess Ida, and Ruddigore. Note that this CD can be played only on a computer, not on a conventional audio player. Francis does not report that any alternate takes were issued with this set, but Chris Webster has confirmed them for sides 4, 11, and 20. Francis says that Arthur Wood conducts only s. 7, "As someday it may happen". However, s. 9 was also recorded the same day, and it seems implausible that Wood was brought in to conduct just one side. Other sides (unpublished) could, of course, have been recorded that day. Francis says that s. 16 was recorded on 2 August 1917. However, the matrix number is much higher than any other in the set, so if Francis is right, we must accept the unlikely premise that a matrix number was used out of order. More likely, Francis's date is inaccurate. Sides 15 & 21 were included on Arabesque's LP reissue of the 1931 Ruddigore. Where there were multiple attempts at a side on the same day, at least one of which was issued, the word "Issued" and the side number appear in the "Result" column. For takes not known to have been issued, the matrix number is shown in italics. Details of unissued takes were supplied by Chris Webster, who had access to copies of the artist sheets made during the sessions. The roles sung are indicated in brackets, as it would otherwise be ambiguous in some cases.